Windjammers cruise the Maine coast and islands from May through October. July and August are the warmest, but also busiest and most expensive. June and September can be ideal, and somewhat cheaper than high summer. May and October can be adventurous, and are the least expensive times to cruise. You never really know what the weather will be. Don't expect weather along the Maine coast to be like weather anywhere else in New England. It may be cool and foggy on any August morning. It may be warm and toasty in the sun in October (but it will definitely be chilly at night). You really need to be prepared for any sort of weather, from bathing suit to sweater to driving rain. See What to Bring. 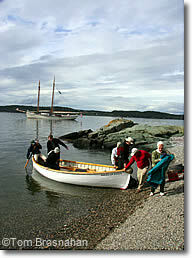 Coming ashore for a picnic on a warm evening in May. Not all evenings are so warm...or sunny.